Today we're able to bring you the 3rd chapter in Pysyk's ongoing series that we've called 'On the Mark'. 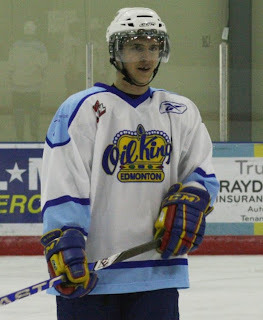 The member of the Edmonton Oil Kings represented the team at the annual CHL Top Prospects Game a couple of weeks ago and its that experience that Pysyk (Photo: Andy Devlin/Edmonton Oil Kings) shares with our readers today. Starting February 1st here at Coming Down the Pipe! we will be presenting a new month-long series. 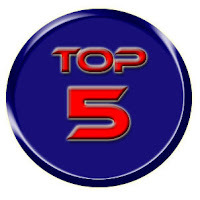 We've been asked several times over the last couple of years to do top 20 rankings for teams or leagues, countries, you name it. We've never done it. What stage is the Oilers rebuild in? When the Chicago Blackhawks rolled through town this week it was written everywhere but in the sky that the Hawks formula for rebuilding is the one Edmonton should be following. Chicago enjoyed several high end draft positions to get to where they are now, and if the Oilers indeed are in true rebuilding mode they will enjoy at least 2 years of the same thing. While much of the focus of the 2010 draft has been spent on Taylor Hall and Tyler Seguin, whichever team draws the 3rd spot is going to get a terrific defenceman. That player joined Guy and myself Tuesday night. We started our conversation with Cam Fowler asking him if he had done any gloating in the Windsor dressing room after winning gold at the World Junior Championship with Team USA. Wisely he hadn't as 4 of his Spitfire teammates were on the losing squad in the gold medal game and as smooth as Fowler is on the ice, I don't think he could escape all 4 of them. "The fans will need a sacrifice." That from a caller to Oilers Lunch a week or so ago. Radio host Bob Stauffer was fielding calls from Oiler fans, many who are relishing the thought that the team will end up with a lottery pick this June and some who demand change from the organization. When a team finishes dead last in a professional league it is reasonable to expect that someone will lose their job as a result. Perhaps more than one. Sometimes it's not who the fans believe deserves to get fired and other times it's actually pretty predictable. I believe there will be a price to be paid for Edmonton's futility this year and I predict that the person(s) who are let go will (A) not satisfy the fans and (B) is fairly simple to foresee. 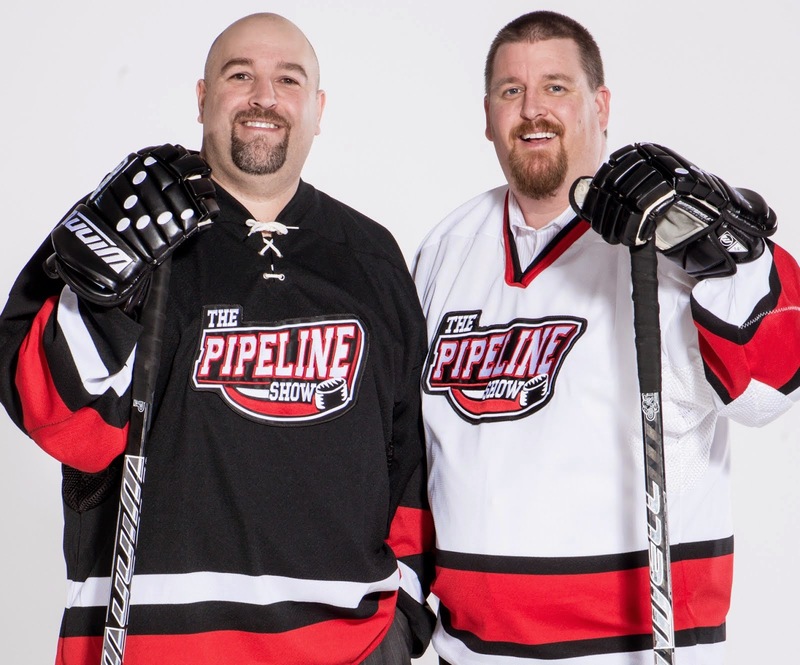 One of the things we like to do on The Pipeline Show is catch up with players who we talked to during their junior years who are now stepping up to the pro level. One such player is netminder Braden Holtby of the Washington Capitals. 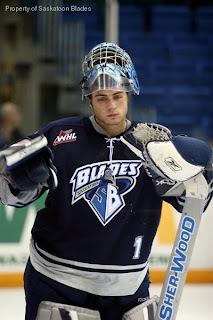 We first started talking to and about Holtby back in 2006 when he was in his rookie year with the WHL's Saskatoon Blades. In an on-air interview with WHL broadcater Cam Moon, we asked who the next big goalie coming up in the WHL might be and a 16-year-old Holtby was the name that came up. 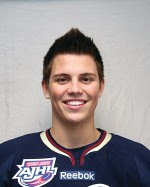 Since then we've seen him backstop the Blades to the top of the WHL's Eastern Conference, get drafted in the 4th round by the Washinton Capitals in 2008 and finish his junir career was one of the most promising goalie prospects coming out of the CHL. It was time for us to catch up with Holtby and see how he's making out as a rookie in the American Hockey League with the defending champs, the Hershey Bears, and we did so on TPS this past week. Just a heads up that we have 2 new contests running on The Pipeline Show. Check out our contest section to find out the details. I know what you're thinking: The 2010 draft is still 6 months away... why bother with a 2011 list? But if you know anything about what we do here at Coming Down the Pipe! and on The Pipeline Show, you shouldn't be too surprised. We always have our eyes on the future. I keep hearing about how bad the 2011 NHL Draft is supposed to be and yet I find that to be a little misleading. Afterall, the 2008 WHL Bantam Draft was one of the strongest in recent memory and there is a blueliner available who some have told me might be the best player in his position to come out of Europe in a very long time. It might be a bit of a down year for the OHL, compared to recent years, but does that make 2001 a weak draft class all on its own? Of course not but still I am told that the overall depth won't be the same as we've had with 2008, 2009 and the group available in June of 2010. Over the weekend Dillon Simpson committed to the University of North Dakota Fighting Sioux. The 16 year old rookie defenceman with the Spruce Grove Saints has 8 goals and 34 points this year in 47 games with the number one ranked Junior A team in the country. Simpson has heated up recently with 7 points in his past 4 games. 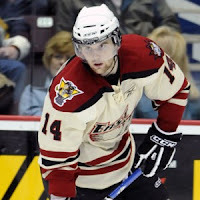 He was an 8th round choice of the Kelowna Rockets in the 2008 WHL bantam draft, but would have gone much higher, possibly in the first round had he not been leaning towards the NCAA. Simpson is the son of former NHLer and current Hockey Night in Canada broadcaster Craig Simpson and is following in his father's skate strides, albeit to a different school. Craig attended and played at Michigan State. 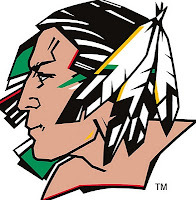 Like his father, Dillon will graduate high school a year early and could play at UND as a 17 year old next year (he turns 17 on February 10th) but I've been told that that will be up to the Fighting Sioux. Patrice Cormier was suspended for the rest of the regular season and the playoff, which is over 40 games if Rouyn-Noranda goes 7 games in every series. I haven't heard anyone say it was to long, but a lot that have said it was justified. CHL commish David Branch will appear on The Pipeline Show tomorrow night, and we'll talk with Branch about the lengthy suspensions that have been handed out in junior hockey this year. If you have a question for Branch. pipeup@theteam1260.com. An update now on forward Jacob Fallon, who recently left the US Under 18 team. Fallon is on the Seattle Thunderbirds protected list but has committed to the Michigan Wolverines next year, and it appears he'll keep his pledge to the Wolverines. 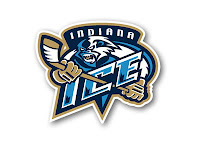 Fallon is staying in the USHL and has gone from the U18 team to the Indiana Ice. He's played 2 games with the ice so far, meaning he is no longer elegible for the WHL this season. The Tbirds did try and contact Fallon but he didn't respond, so the team is assuming Fallon is not interested in the WHL at this time. 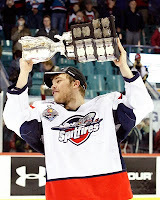 Fallon will stay on Seattle's protected list should he decide to play in the CHL next year. I think it will depend on what NHL team drafts him this June. I'd imagine the Tbirds aren't holding out much hope for him, seeing as he didn't return their phone calls. As the Oilers sit just one point out of last place heading into action tonight, they are getting closer (much to some fans happiness) to the first overall pick. Or as my colleague at Global Sports John Sexsmith put it, they are on the "Highway To Hall." But John took it one step further, penning some lyrics for the theme to finish off the Oilers season. The Pipeline Show is in talks with a band to put some music to this and we'll air it on our show, but if you're a musician, let us know if you want to take a stab at it, who knows maybe you'll get your stuff played on our show. Here are the lyrics from John. Enjoy. OHL commish David Branch today announced that Windsor Spitifires forward Zack Kassian has been suspended for 20 games after his hit on Barrie's Matt Kennedy. When Sportsnet's Sam Cosentino was on the program Tuesday, he spoke about an angle he saw that night that showed, frame by frame, Kassian not leaving his feet. So what do you think... too light, too heavy or just right? we offer up 2 different video replays of the incident and our thoughts after 'Read More'. 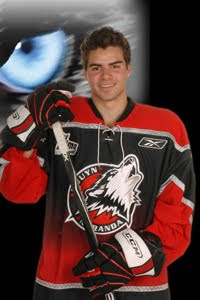 Tuesday night on The Pipeline Show I had a chance to catch up with Rouyn-Noranda Huskies forward Philippe Cornet. The QMJHL team has been in the news as of late, first because of their aggressive trade deadline acquisitions that has positioned the club to be a potential contender for the league title. The other newsworthy item featuring the Huskies as of late has been the suspension of forward Patrice Cormier after his dangerous and blatant elbow against Mikael Tam of the Quebec Remparts. cornet, a prospect of the Edmonton Oilers, talked about joining the Huskies after three years in Rimouski, his failure to crack Canada's WJC roster, the changes to Rouyn-Noranda's roster and what the impact of his friend's actions may have on his team's chances this Spring. Yesterday I wrote about 3 suspensions and one player quitting the US Under 18 team. The player who left the program is Jacob Fallon. His WHL rights are held by the Seattle Thunderbirds. In an exchange of emails with Seattle G.M. Russ Farwell I have confirmed that the T-Birds have reached out to Jacob to discuss his level of interest and are waiting to hear back from him. Fallon can play for Seattle this year as long as he hasn't played a game after January 10th, providing the Thunderbirds have room on their 25 man roster for him. Currently Seattle trails Kelowna by 5 points for the final playoff spot in the Western Conference. Recently the U.S. National development team handed out some discipline and one player has left the program. It's been a while since I did a NCAA update, mostly because of the break over the holiday season but that has all come to an end now and so we're back at it again. 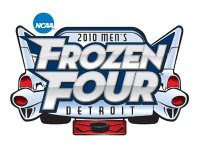 In case you missed it, there was also an outdoor NCAA game at Fenway Park and the first round of candidates for the Hobey Baker Award have been released. Prince George Cougar forward Brett Connolly will have a good seat for the CHL Top Prospects game. He'll be watching it in front of the TV from home. Connolly has only appeared in 12 games this year, due to a nagging hip flexor injury and now it will keep him out of the Top Prospects game in Windsor next week. The 4th ranked North American skater has 13 points so far this season, but hasn't played in a game since December 5th and there's no exact word on when he will be back in the Cougars line-up. He does plan to come back this year and with a good finish will likely make his second appearance on Canada's under 18 World Championship team. He hasn't played in two months and Central scouting dropped him in their mid-term rankings to the middle of the 1st round but I still think that on draft day 2010... Kirill Kabanov will be the first Russian name put on the board. 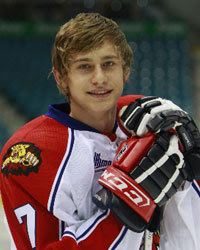 Each week on The Pipeline Show we make a point of introducing another 2010 draft eligible player to the masses and this week's guest was Moncton's sensational import, Kirill Kabanov (Listen HERE). We talked about the injury, how it happened, should it have been handled differently, his relationship with the Russian Hockey Federation and especially head coach Vladimir Plyuschev and how Nikita Filatov's playing in the KHL might impact the Russian draft class of 2010. 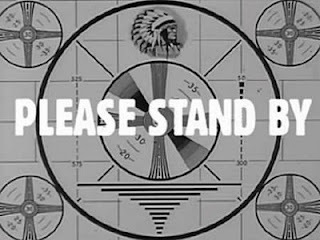 I'm going to be honest: With Millard on the shelf and me overbooking the show tonight I'm swamped so... 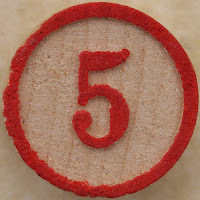 I'm resorting to second hand info for this week's Top 5. With the Oil Kings in the cellar of the WHL there is interest in knowing something about the quality of the Bantam draft this year. It's not a level of hockey that we cover much on The Pipeline Show so I'm going outside the show's normal contributors for some insight. Matt Bugg from Dobbershockey.com was kind enough to supply me with a few names that will be available for the 2010 WHL Bantam Draft. Here is an excerpt from the 'Leans Teens?' piece "Mr.Bugg" contributed to the DobberHockey Mid-Season Guide that pertains to players eligible for the 2010 WHL Bantam Draft. With the WHL trade deadline now officially in the books, the Edmonton Oil Kings look considerably different than they did just a couple of weeks ago. In all, GM Bob Green executed three deals between Christmas and the deadline which has seen 4 assets (all players) on the way out while a potential of 9 pieces are coming back his way. Is the team better today than they were two weeks ago? Certainly not. Is the organization better off because of the choices Green and his staff have made? Almost definitely. Did the team do enough or were there more deals that should have been completed? Debatable. It's no surprise but Alex Pietrangelo's return to the Niagara Ice Dogs was a very short one as the St. Louis Blues prospect has been traded to Barrie in a massive 11-asset swap today. Just a few days since being returned to junior by the Blues, Pietrangelo joins the Barrie Colts the top ranked team in the Eastern Conference of the Ontario Hockey League. Is it enough for the Colts to challenge the Windsor Spitfires for the league title? 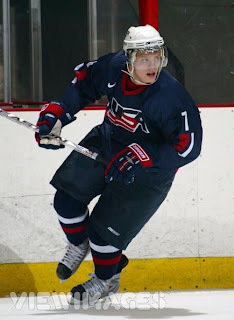 Like most of you, I was glued to the TV on Tuesday night as Canada and the United States battled for the gold medal at the 2010 World Junior Championship in Saskatoon. Unlike most of you, I missed all of the highlights of the game winner because as soon as it went in, I was bolting out the door. I was watching the game with a few of the other TEAM 1260 personalities at The Shark Club just a few blocks away from the station but had to zip back to the studio because I was working the post game show with Corey Graham. I saw the goal live but didn't realize how remarkable a play it was until the next day. The head coach of the Columbus Blue Jackets is under duress with the situation his team is in right now considering the NHL standings. With the team in town to face the equally struggling Edmonton Oilers, The Pipeline Show was on hand to follow up the story originally broken by Dean Millard earlier this week while covering the World Junior Championship in Saskatoon. Today I asked coach Ken Hitchcock to comment on his relationship with Russian prospect Nikita Filatov and the comments the player made in regards to his future with the team. Unlike the player, Hitchcock was not willing to close the door on the situation and one could almost suggest he has extended an olive branch to the organization's top prospect. Some big names were shuffled around today as the QMJHL trade deadline came crashing down and the division between the contenders and the pretenders is now extremely clear. There was a total of 21 transactions completed and here are a few of the major ones that will have huge ramifications on the league down the stretch to the playoffs and beyond. The CHL trade deadlines are rapidly coming up and as with the NHL, the deals are rolling in at an increasing pace. With the World Junior Championship now in the rear view mirror, big name players have already been dealt and there will be more to come in the next few days. Here is a bit of a recap of some of the notable trades we've seen in the last few weeks. We're hours away from the gold medal border battle between Canada and the United States at the World Junior Championship, so today on Top 5 Tuesday we'll take a look at 5 things to watch out for. After Russia lost it's second straight game Monday night at the World Junior Championship, giving them a disappointing 6th place finish, their star player dropped a few bombs when speaking about his future in the NHL. Nikita Filatov, who should have been one of the top 3 scorers in the tournament, finished outside of the top 29 scorers with 6 points in 6 games and it sounded like he might be finished with the Columbus Blue Jackets. Finland had high hopes of earning a medal at the World Junior Championship after facing relegation and finishing 7th at last year's tournament but those hopes were dashed by the United States Saturday night. Finland will now face Russia for 5th place on Monday. Finland had 7 returning players on this year's squad including their top line of Teemu Hartikainen (Edm 2008), Toni Rajala (Edm 2009) and Mikael Granlund (eligible 2010). However the trio, along with the entire Finnish offence was underwhelming. The WHL trade deadline is January 10th, just 5 days after the World Junior Championship. A player isn't supposed to be traded during the tournament, but it does happen, it's just not officially announced until after the event. Here are a few blueliners who will be available leading up to the deadline. Some of these players may have already been dealt, but as mentioned it can't be announced until they return to their WHL teams.